Back in 2010, Nintendo published an amusing little WiiWare title called ThruSpace, a game which at its very core simply involved flipping, turning and moving a block around in order to fit through gaps in walls. KeysFactory, the developer responsible for that title, has now created SpeedThru: Potzol's Puzzle — known as Ketzal's Corridors in North America — for the 3DS eShop, and in case the title wasn't a bit of a giveaway, it involves almost exactly the same concept. Thankfully, while the WiiWare game was a bit basic in terms of presentation, things have been spiced up a little here. 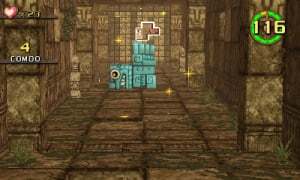 No more dull white corridors and single colour blocks: the whole game has an aztec theme, with levels all taking place in jungles, caves, temples and more, and the blocks bearing intricate animal motifs. There's also a bit of a story, which isn't particularly interesting or original, but at least it's something. The gameplay is mostly still the same. As your block floats forward through the air, you will come upon large walls one by one, each with one or multiple shapes in them. For the lazy ones just wanting to "beat" the game, it's a simple matter of just turning and twisting your block around and moving it into the right position so it simply floats right through the gap. The real challenge of the game, however, is in getting a good score on each level, which awards you with medals from bronze to gold. 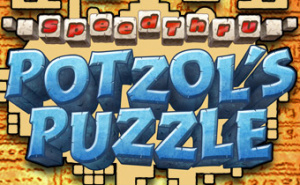 Getting all gold medals will certainly pose a stern challenge even to seasoned puzzle experts. If you're chasing a higher score, simply going through each wall isn't going to cut it, often leaving you with a bronze medal at best. Instead, you'll have to hover in front of every square of the wall that's open: hover in front of every hole in the upcoming wall and then go through the wall for more points than normal. That is, if you hit one of the hearts in the opening(s), which is required for you to receive points; miss it and your combo will be reset. If you just go through the walls normally, you'll only collect the hearts you actually bump into, but if you "fill up" all the squares, you'll automatically collect every heart in the current wall, as long as you hit at least one of them. It sounds more complex than it is, and within a few minutes you'll be gliding through holes with ease. The control scheme is fairly similar to that of its predecessor as well, though obviously adapted to work on the 3DS. X and B will spin your block around forward or backward, while Y and A will spin it around sideways and the R button will simply flip it around 90 degrees. The L button speeds you up if you're feeling confident, while the D-Pad or Circle Pad move the block around. As you can only move in four directions you may find the D-Pad more accurate than the Circle Pad, but both are supported. Many of the stages, especially later on, will also have moving panels and other hazards between walls, hitting one of these will generally lose you time and reset your combo. Hitting an actual wall without going through a hole will cause a game over, forcing you to restart from the beginning, but luckily the stages aren't too long and the game helpfully slows down time a little when you're dangerously close to ramming headfirst into stone. ThruSpace on WiiWare only had one additional type of level in the form of an endless mode, but SpeedThru offers some more interesting new modes. 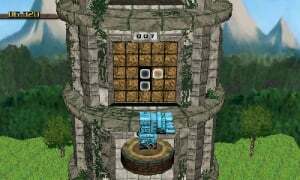 In tower stages you must very quickly spin yourself around to fit perfectly in holes on the tower's exterior in order to proceed to the next floor, while in the nerve-wracking tunnel stages every "open" square on each wall is actually blocked off: the only way to pass through these is by using the aforementioned method of floating in front of every required section of the wall. This mode leads to plenty of panicked moments as you spin and turn like mad as the wall gets closer and closer. The game has three main worlds, all of which are, for some reason, almost exactly the same in layout. 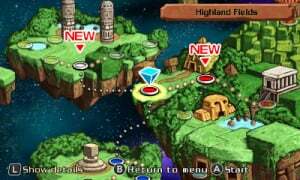 There's one straight path to the end of each which consists of nothing but standard stages, but getting enough hearts or simply clearing certain stages will unlock dead-end side paths, which exclusively consist of the new types of stages and endless modes. You'll primarily be controlling only one block (which changes in each world), but two of the side sections in each world will force you to play with a special, much bigger block; one such stage in world three is a sight to behold. After beating all three main worlds, you'll unlock a short last one with four more stages, in which you use all three of the previous main blocks — not at the same time, of course. After all is said and done there's not really much to do other than going back and attempting to get gold medals on everything, which can be quite a challenge with the 60 or so stages on offer. If you can manage to do that, then there's always the endless levels to try and improve your score on. SpeedThru is quite similar to ThruSpace with a graphical makeover, and can be cleared quite quickly and easily if you're not particularly interested in getting good scores. If you are, however, the game can last you quite a while, and for those who quite enjoyed its predecessor, the new level types are worth checking out. NOt played the wii version, so really looking forward to this, its been ages since we had a good new 3dware game. I tried the demo of the Wiiware version and found the controls to be too difficult, but luckily they sound much better this time! I need a demo,.. looks fun but rather try this one first. might have to pick this one up! Nice. A review of a first party downloadable 3DS game a few hours before its even out. Will buy later if I'm not still busy with Rhythm Thief. Interesting, not sure if I'll get it when it comes. I really liked the WiiWare version. Of course there's practice involved, moving and twisting the shapes. Especially later, at ultra high speeds. But once you have the controls down this is such a frantic and fresh experience. Thank you for the detailed review. Off to try this one out now. Always a fan of puzzles, so I'll get this down the road. You didn't mention the multiplayer? I like the fact in one mode you can use the same system, WarioWare style. I didn't really like the controls on the WiiWare demo, but I think I'll get this anyway. The subtitle made me expect something negative, but this is good news. @C-Olimar I didn't have chance to test multiplayer, but it's pretty simple stuff, both players pick one of the three main blocks and try to match 10 shapes as quickly as possible. Hmm, curious but not sure if I'll end up picking it up. @Koapa: I too found «Fun Fun Minigolf Touch» rather weak, and ended up removing it from the console. I purchased Speedthru half an hour ago and it's more engaging than the game mentioned above. 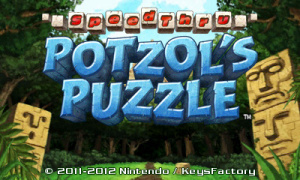 Actually I thought that it will be like the Fit game from Tetris Axis, but it is much more than that. Still not sure on this one but I might end up getting it eventually. Its £5! if you dont like it you have lost nothing! The trailers made me dizzy, so I think I'll pass when it comes to NA. @ BudrSbastig: Thanks for the tip, I'll give them a try! This game is great. It is incredibly well made and I haven't had any controls issues at all during my play time. The endless modes are also quite a bit of fun.